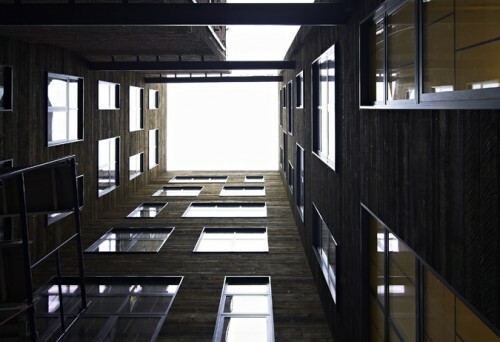 Located in the Soho Cast Iron Historic district, XOCO325 (pronounced sho/co) is a 9-story, 24-unit condo development. Named after the Catalan word for chocolate, the project involves the renovation of a former Tootsie chocolate factory, and a new structure cloaked in a custom cast aluminum screen. The condos range in size from just over 1,000 sq. ft. to nearly 5,000 sq. ft. and are connected by a central courtyard. The design, development, and construction of the project has all been coordinated by New York-based office DDG who specializes in inclusive project delivery. Peter Guthrie, Chief Creative Officer and Head of Design & Construction of DDG, says from very early on, this “one-stop-shop” approach to development was rooted in the idea of embracing unique material qualities in construction. “At 41 Bond Street – one of our first projects – we were hand carving bluestone pieces on site. One of the ideas we had early on was that by doing this ourselves in house, and controlling everything throughout the process, we could bring back an element of craft that other companies couldn’t afford to do.” The most prominent feature of XOCO325 is a custom cast aluminum screen, carefully developed through an extensive survey of the cast iron district, where roughly 250 cast iron buildings reside. Through this study, the project team began to understand the cast iron facade as an industrialized “kit of parts” approach to architecture where design and construction rely heavily on series of componentry made available through pattern books. Inspiration also came from contemporary catalogs such as McMaster-Carr’s online website, which Guthrie labels as a “bible of industrial parts.” The catalog includes everything from bolts and screws to street lamp posts and furniture. DDG adopted this attitude of mass-produced componentry in their digitally developed forms, arriving at a proportioning system and bay spacing reminiscent of historical buildings in the area. “We’re always interested in the intersection between old-fashioned hand craft, and modern machined factory production,” says Guthrie. “There was an angle here we wanted to explore. Aluminum was light and, in the end, more affordable than replicating cast iron.” The project team developed a repetitive spandrel and column shape, working with a foundry to develop reusable composite forms with a weathered burlap texture. When prototyping versions of the system, the project team prioritized formal adjustments to the massing such as curvature and shadow lines to emphasize a sense of depth found on facades of historic buildings in the district. By “delaminating” the building enclosure system from the cast aluminum screen, a two-foot gap was established allowing the residential units to have a full span curtain wall glazing, while still maintaining some level of security and privacy. “That was our way of getting both: making a modern building without compromising on psychological stability and privacy.” This configuration is celebrated by the project team as having a “robust stability.” Within this space, balconies occupy the courtyard facing units, while a custom planter system comprised of pockets cast into the screen and a series of cables, is incorporated onto the primary street facade. The project is beginning sales, with an anticipated completion in 2016. It's not every day that architects get a public space named after one of their own, but tucked away in Lower Manhattan is a small pedestrian plaza named after one of the most important 19th-century architects around. Bogardus Plaza occupies one block of Hudson Street on the corner of Chambers Street and West Broadway only a few blocks from AN headquarters and is named from James Bogardus (1800-1874), the inventor of the cast-iron building, and last week the plaza received a fresh coat of gravel-epoxy paint. Bogardus' cast-iron buildings revolutionized architecture and represented a distinctly modern take on building during the Industrial Revolution. For the first time, building elements could be mass produced and quickly assembled on site all while retaining the ornate facades fashionable in the middle of the 19th century. Cast iron as a material, predating modern steel, also permitted unprecedented expanses of glass within cast-iron facades emitting natural light deep into the buildings. Bogardus also espoused the fireproof qualities of his new building type. Examples of cast-iron architecture can be found in neighborhoods throughout New York, especially in TriBeCa, Soho, and the Financial District and Bogardus' legacy can be felt throughout the country in cities like Portland, Louisville, KY and Washington, D.C. where many cast-iron structures still remain. Only a few examples of Bogardus' work remain in New York including structures at 75 Murray Street (1857) and 85 Leonard Street (1860) both near the plaza. The viewing garden at Bogardus Plaza was established in 1996 in what was once a barren traffic island. Noted preservationist Margot Gayle lobbied for the site to be named after Bogardus. Gayle is responsible for the creation of the 26-block Soho-Cast Iron Historic District and author of the seminal Cast Iron Architecture in New York and Cast Iron Architecture in America: The Significance of James Bogardus. 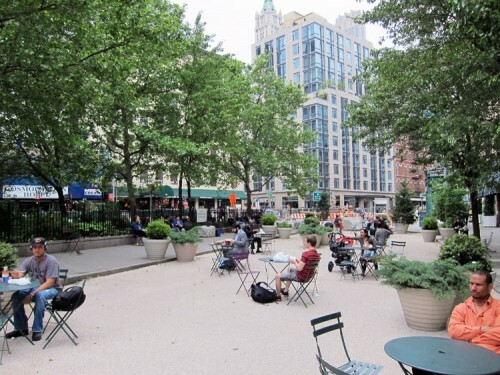 The site, maintained by Friends of the Bogardus Garden, was expanded in 2010 to include a temporary plaza on Hudson Street while road construction took place nearby and was made permanent in late 2011 due to widespread popularity of the new public space. Last week, we took a trip around the block from the AN office to go to an open house at 55 Warren hosted by Legrand, the French systems management company. While we were impressed with all the gizmos and glitzy gadgets, it was OCV Architect's clever renovation of the old cast-iron building that grabbed our attention. That's not to say that Legrand didn't impress. Vantage, a subsidiary of Legrand, came in after the walls were painted and moldings affixed before fitting setting up the control network for everything from the shades to security by using radio and wifi. No plaster was destroyed in the effort. An iPhone app allows owners to adjust their Tribeca lighting while in the Hamptons. The glitz factor came with a presentation of Legrand's latest acquisition, Bticino, the Italian fixture company. Their Swarovski-encrusted light switches are tempered by more tame choices of wenge, granite and marble. But back to the architecture... OCV received the necessary Landmark approvals to scoop out the center of this historic structure to create a courtyard light well. Often, these old industrial buildings are quite dark at the center of the floorplate. While losing 2,050 square feet might make the any developer cringe, OCV replaced square footage by plopping it back on top in the form of a $14 million penthouse that's set back far enough from the facade to appease Landmarks. Morris Adjmi seems to be on something of an inversion kick as of late. His design proposal for a building on Walker Street, which was approved by the Landmarks Preservation Commission (LPC) in June, used an inverted bas relief effect that made the concrete facade seem as though a cast iron building was pressed into a large piece of clay. The new proposal for the southwest corner of Lafayette and Great Jones Street uses a similar technique, but in aluminum sections. But at a public hearing on Tuesday LPC put the breaks on the Lafayette proposal, saying the architect needed more depth and detail. "In general, they asked for the addition of more variety, depth and articulation of the facade, particularly the long facade," Landmarks spokesperson Elisabeth de Bourbon wrote in an email. Walker Street's concrete facade riffed on classic cast iron components ordered from 19th century catalogues. The architect employed the same effect here, with the inverted half columns working their way up the face of building, but this time in aluminum cladding. "It’s a theme you see in both projects," said Adjmi. "Walker is more of a cast impression, whereas this is fabricated in components." The new building will replace a one story garage built in 1933. As it sits in the NoHo historic district it could have taken cues from a variety of styles, not just catalogue cast iron. Adjmi said he also drew inspiration from a another source: the loggia of Colonnade Row. Still, most of the composition remains a takeoff on classic cast iron and the Colonnade Row quotations are saved for the top floor. There a series of columns span the width, as below, but the street wall sets back from the columns creating a loggia crown. 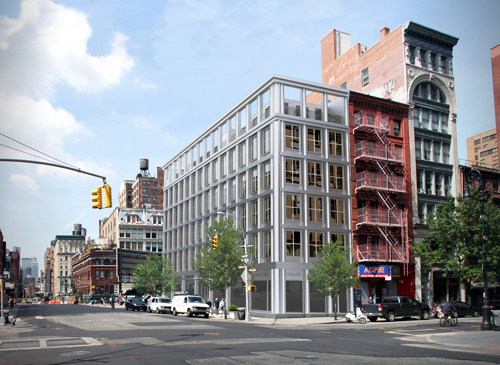 Adjmi said that for further inspiration he also looked at the Donald Judd Foundation, which is currently undergoing restoration at 101 Spring Street. The Judd building also occupies a 20 foot by 100 foot plot. "This was similar and I looked at that as a way of how to organize a façade," said Adjmi. "Though its abstract and modern. Here we rarify it down to the essential elements." But the approach might have been too rarified for the commissioners. "I think they like the articulation of the base the middle and the top," said Adjmi, adding the stripped down version might have been too "relentless" for LPC. "It's difficult because in one regard we want to realte to the historic fabric that makes up the district, but for me the idea was to strip that back, like a modern composer who takes cuse from classical works but presents them in a minimal way." 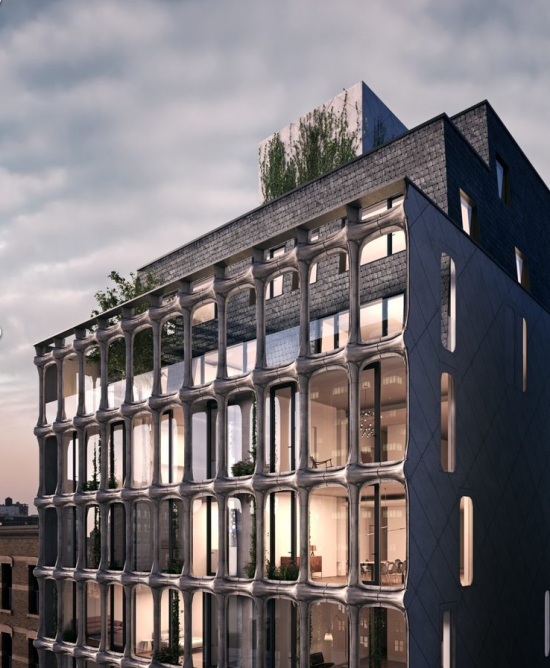 With unanimous approval from the Landmarks Preservation Commission, Morris Adjmi's deceptively subtle take on the classic cast iron building is on its way to becoming reality. What at first glance appears to be a cast iron facade is actually a reverse bas relief cast in glass reinforced concrete—essentially a form in which you could mold a true cast iron facade. "This makes you think of how these buildings were built, from the initial casting to being assembled as components," said Adjmi. "So this is really taking that and inverting it so it becomes a record of the process." The architect said that assembling the facade would be carried out in the same fashion as the nineteenth century buildings, as if ordered from the Bogardus cast iron catalogue—James Bogardus patented the cast iron building in 1850. 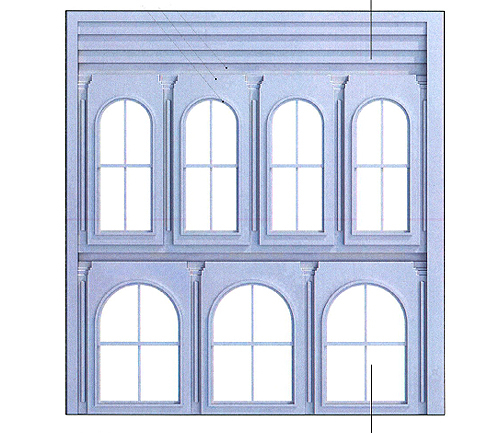 Columns, lintels, and window arches will be cast separately and then individually secured to the facade. "It’ll sit right on the slab so you get the full effect of the inverted façade," said Adjmi. If the effect on the street will command a double take then the interior will surely give pause. There, the positive of the facade will push into the interior, with the traditional exterior facade facing in living space. Adjmi said that he was inspired by the work of artist Rachel Whiteread whose 1993 piece, House, cast the interior of a house in London's East End in concrete. "I’ve always loved her work," said Adjmi, "and it was a natural progression from using historical references to reinterpreting them with modern materials." Apparently, the commissioners agreed. As the building is slightly higher than the zoning law allows, the next stop is City Planning, with the hope of beginning construction in six to eight months. Another piece of New York City's historic fabric is disappearing. But only for a short time! We hope... Curbed swung by 74 Grand Street today and discovered that deconstruction of the five story cast-iron building was just getting under way. The building has been leaning for years after being undermined by construction a neighboring lot. Because it had gotten so bad recently—some 30 inches out of alignment in spots—the Department of Buildings declared the building would come down before it brought the entire blog along with it. Afraid a unique piece of the city would be lost, the LPC demanded the facade be replaced whenever a new building gets built on the site, and it would be locked up in a city warehouse until then. The LPC signed on reluctantly, as the oldest cast-iron facade in the city was once stolen from such a warehouse and sold for scrap. We've got our fingers crossed this time around.